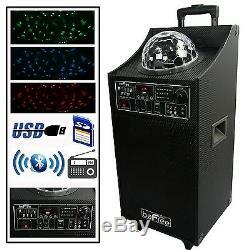 BEFREE 10 800W BLUETOOTH PROFESSIONAL PA SYSTEM USB MP3 PLAYER w/ PARTY LIGHT. BeFree Sound Projection Party Light Dome 10 Inch Subwoofer Bluetooth Portable Party Speaker with USB/ SD Input, FM Radio, Remote Control and Microphone. BeFree Sound's Projection Party Light Dome 10 Inch Sub-woofer Bluetooth Portable Party Speaker offers both stunning sound and an extremely fun projection light dome that really sets the mood for you and your guests! This is a 2 way speaker and can be used in unison with another unit as a main or passive speaker giving you the power to amplify the sound by adding another unit with an AV cable connection. A Mic Jack and Guitar Jack let you connect these items and set their priority with a Mic priority switch. You can choose to use this speaker with or without the light projection which makes it ideal for a professional setting as well as a party scene. Features: 800 Watts Power 10 Inch Sub-Woofer 7" x 4.5" LED Light Projection Dome Double Audio Input (can be used as passive speaker) Double Audio Output (can be used as main speaker) Bluetooth FM Radio USB Input SD Input Bass, Treble, Echo Levers Mic Volume Lever Guitar Volume Lever Light Power Switch Mic Input Guitar Input Mic Priority Switch AC 100-240v 50/60Hz Includes Remote Control: Requires 2 x AAA Batteries (Batteries not included) Includes Wireless Microphone : Requires 2 AA Batteries (Batteries not included) Built in Side Handles Rolling Handle extends 10.5" above the unit Two Double 0.75" back wheels Two fixed front legs Item Dimension: 29.75" x 12.5" x 13.5 Item Weight: 30.3 LB. _gsrx_vers_779 GS 7.0.4 (779). The item "BEFREE 800W WATT PA DJ PARTY SPEAKER with BLUETOOTH LIGHT SHOW REMOTE USB/SD/FM" is in sale since Monday, December 18, 2017. This item is in the category "Musical Instruments & Gear\Pro Audio Equipment\Speakers & Monitors". The seller is "etronicspro" and is located in Chico, California.